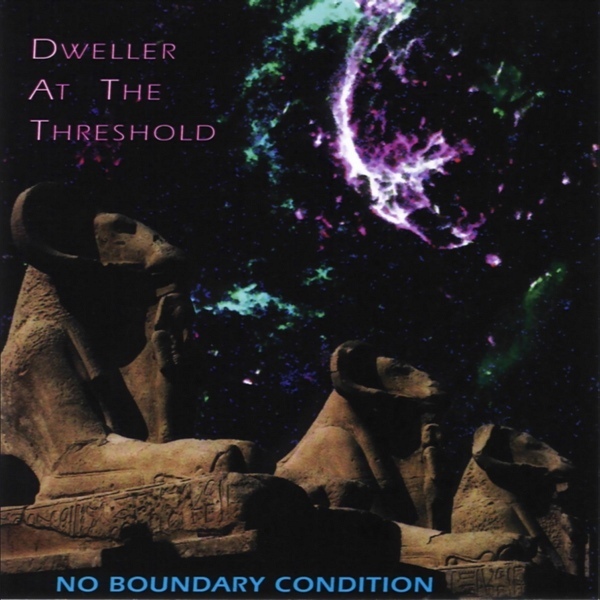 Dweller at the Threshold is a trio of Paul Ellis, Dave Fulton, and Jeff Vasey, on synthesizers, synthesizers, and synthesizers respectively, out to explore the far reaches of a finite universe with no boundaries. Their music is purely electronic, event driven, and very explorative, growing and developing over time. For the most part, it seems to follow no relatable mathematical rhythmic patterns; ideas are born in free space, they grow, blossom and dissolve. For comparisons, one might sense a strong influence of seventies Tangerine Dream, the period from Phaedra to Sorcerer. In much the same way as Heretic (see their review), DATT’s music moves the listener through portals, each revealing a new ‘scene’ with its own unique cast of characters, almost as if it were a soundtrack to a night of dark and restless dreaming. Ultimately one portal leads to the next, and the process begins all over again. Although there are ten tracks listed, everything seems to flow seamlessly together, in cinematic fashion. Their arsenal consists of both analog and digital equipment, from which they produce some wildly original sounds and textures. In all, this is definitely one of the better purely electronic releases I’ve heard in some time, and one I can recommend highly.